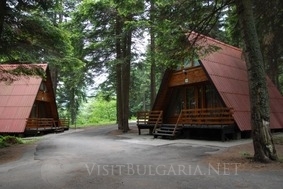 Malina Villas in Borovets Ski Resort in Bulgaria - bookings and reservations. Location: Malina Holiday Village is situated in a venerable pine forest, 2 km from the centre of the resort Borovets, on altitude of 1350 m above the see level, at the foot of the highest peak on the Balkans Mousala peak (2925 m). Malina & Yagoda Holiday Villages are situated in one & the same area. Facilities: At the village the tourists have at their disposal a 60 seats restaurant & a coffee-bar/night club with 40 seats. There are also various food shops in the resort for those guests who prefer to cook their own food.